Do not use a match or live fl ame in the engine compartment. DO NOT ADD COOLANT WHEN THE ENGINE IS HOT: A hot engine is dangerous. If the engine has been running, parts of the engine compartment can become very hot. You could be burned. 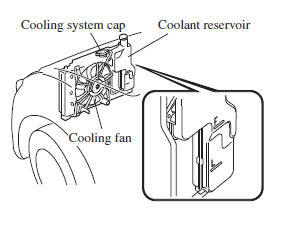 Carefully inspect the engine coolant in the coolant reservoir, but do not open it. cooling system cap when the engine and radiator are hot: When the engine and radiator are hot, scalding coolant and steam may shoot out under pressure and cause serious injury. Changing the coolant should be done by an expert repairer, we recommend an Authorised Mazda Repairer. Inspect the antifreeze protection and coolant level in the coolant reservoir at least once a year—at the beginning of the winter season—and before travelling where temperatures may drop below freezing. Inspect the condition and connections of all cooling system and heater hoses. Replace any that are swollen or deteriorated. The coolant should be at full in the radiator and between the F or FULL and L marks on the coolant reservoir when the engine is cool. If it is at or near L, add enough coolant to the coolant reservoir to provide freezing and corrosion protection and to bring the level to F or FULL. Securely tighten the coolant reservoir tank cap after adding coolant. Radiator coolant will damage paint. Rinse it off quickly if spilled. Do not add only water. Always add a proper coolant mixture. The engine has aluminium parts and must be protected by an ethyleneglycol- based coolant to prevent corrosion and freezing. DO NOT USE coolants Containing Alcohol, methanol, Borate or Silicate. These coolants could damage the cooling system. DO NOT MIX alcohol or methanol with the coolant. This could damage the cooling system. Do not use a solution that contains more than 60% antifreeze. 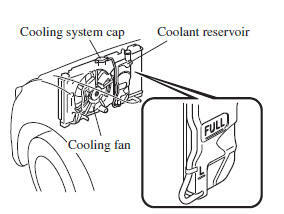 If the “FL22” mark is shown on or near the cooling system cap, use of FL-22 is recommended when replacing engine coolant. Using engine coolant other than FL-22 may cause serious damage to the engine and cooling system. If the coolant reservoir is empty or new coolant is required frequently, consult an expert repairer, we recommend an Authorised Mazda Repairer.